One of the first challenges most startups have is finding their first paying customer. Not long after that the challenge normally becomes finding enough customers to become profitable. Doing this is going to require a marketing effort of some kind whether that is going to networking events and trade shows, handing out flyers or advertising in the local paper. 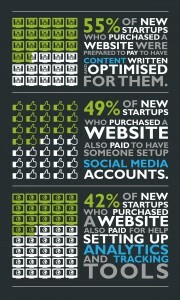 For most new businesses online marketing is going to form part of the mix. At the very least new business will want to show up when people Google them. Those businesses who want to attract customers online will also need to get involved in various areas including content marketing, SEO, social media marketing, PPC and email marketing. As we have discussed in previous blogposts and in our BamGoogled: Digital skills among newly registered businesses report very few startup businesses have the skills to tackle the different areas of digital marketing themselves. If startups want to compete online they are therefore going to have to either start learning about digital marketing or pay someone else to do it for them. For our study on Digital Marketing we spoke to early stage startups who were either in the process of registering a limited company or had very recently registered their business. Although most were expecting to spend some money to get a website live we found that less than 10% had budgeted for any SEO or digital marketing costs. As we have discussed in previous blog posts most new startups don’t have an understanding of how Google works and what is needed to promote their business online. Without this understanding it is not surprising that startups with no background in digital marketing won’t have budgeted for it. We speak to lots of startups who have spent money on getting a website built and then don’t understand why it is not attracting new customers. Invariably it turns out that these businesses have not added any content to their site since it went live, have done no blogging, haven’t done any social media posts, advertising or anything else to push traffic onto the site. As with launching a traditional brick and mortar store there needs to be some element of promotion to get people through the door and onto a website. This does not always need to be high tech. Getting a story in the local press or handing out flyers at a local train station can be just as effective. But simply launching a site and then leaving it rarely results in high levels of traffic. Unfortunately with no skills or budget to promote their site many new businesses don’t manage to get sufficient traffic through their website to sustain their business. Although most startups haven’t budgeted for digital marketing work many are receptive to spending money on it once they understand its importance. Our Business Consultants discuss digital marketing with customers who want an online presence and as a company we make a series of ‘How To Guides’ available for customers to download. We then supplement this with emails giving tips and links to further guides on marketing their sites, including guides produced by Google. All of this information helps us to educate the startups we deal with. While this information allows some new businesses to start doing their own digital marketing around half choose to pay to have elements of the work done for them. 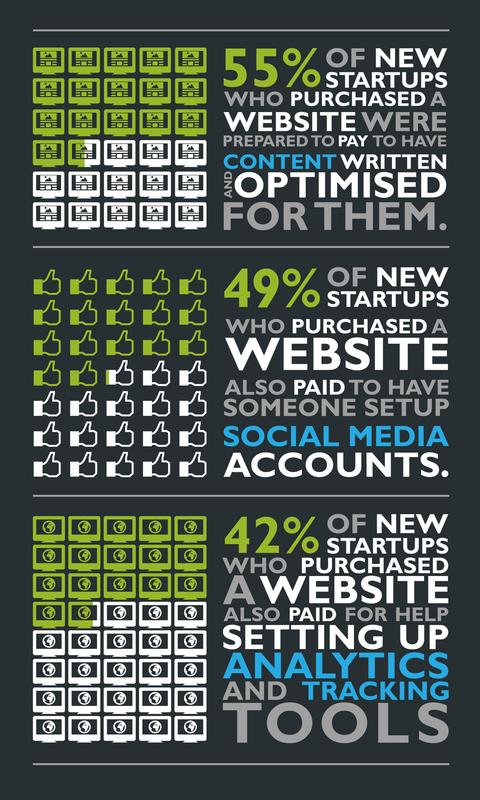 The most common tasks outsourced by new businesses were the writing of their website content, setting up social media accounts and getting their websites setup on Analytics and Webmaster Tools/Search Console. So although most new startup businesses begin with little knowledge of digital marketing with a little bit of education many are prepared to pay to have some work done. Those businesses that do pay for initial digital marketing work to be completed on their website are then in a better position to launch their business with the knowledge that they have the basics done and a platform to build on. The Company Warehouse provide business startup packages which include limited company formation, websites and email. They also provide managed digital marketing packages for startups and small businesses.